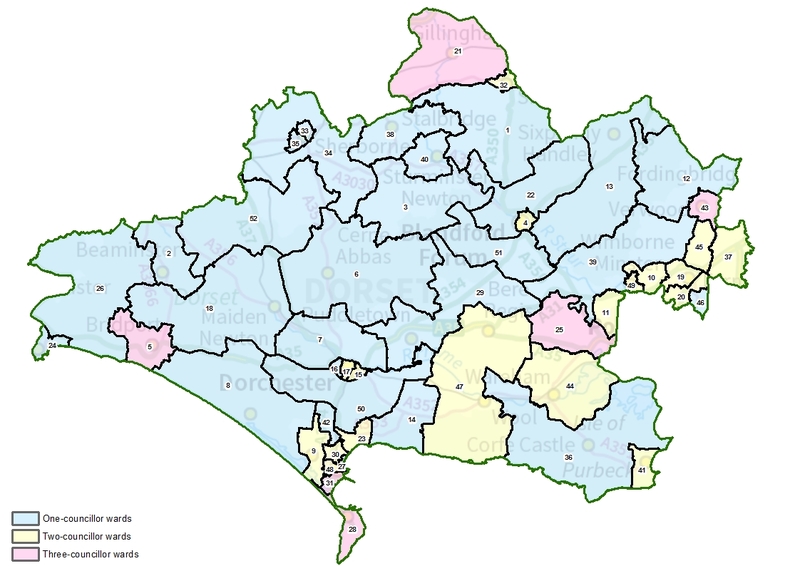 Ward boundaries for the new Dorset Council have been published by the Local Government Boundary Commission for England. Local government in Dorset is changing. Next year, Dorset County Council and all other councils will be replaced by two new local authorities. In the west of the county, a Dorset Council will be established to replace the county and district councils. 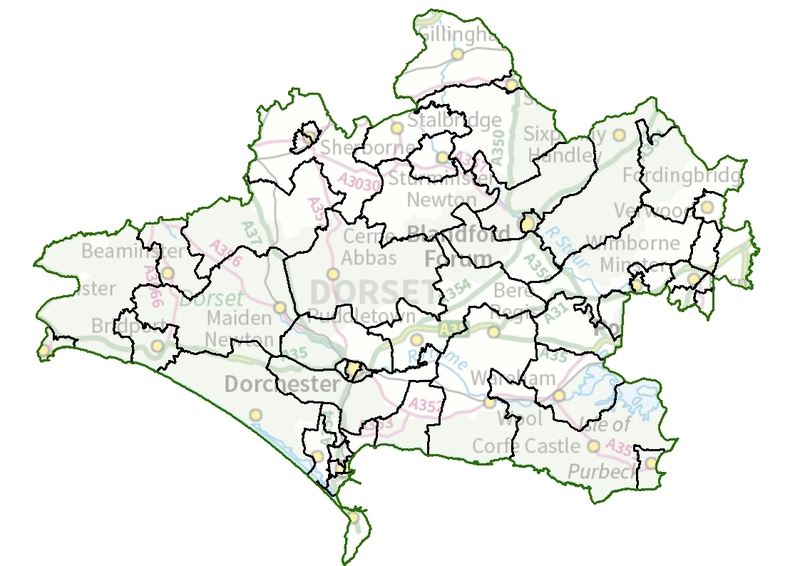 The Commission has drawn up the boundaries following an electoral review of the area currently covered by East Dorset, North Dorset, Purbeck, Weymouth & Portland and West Dorset district councils. The review creates new wards that will be represented by the Dorset Council’s 82 councillors. The new arrangements will come into effect at the council’s first elections next year. A review of ward boundaries for the new Bournemouth, Christchurch and Poole Council, covering the east of the county, has taken place at the same time. The Commission’s final recommendations propose that Dorset’s 82 councillors should represent six three-councillor wards, eighteen two-councillor wards and twenty-eight one-councillor wards. Professor Colin Mellors, Chair of the Commission, said, “We are grateful to everyone who took the opportunity to have their say on how they should be represented in the future. We looked carefully at every submission we received before finalising the recommendations. In response to local feedback during the public consultation, the Commission has changed some of the proposals it put forward in July. In Purbeck, the Commission has listened to evidence presented to it that Holton Heath shared closer community ties with Sandford rather than the Lytchett Minster & Upton ward as previously proposed. It has therefore changed its recommendations so that the Holton Heath area will be included with Sandiford in Wareham ward. As part of its draft proposals for the Purbeck area, the Commission had divided the parish of Wool between two wards. Having listened to local representations that objected to the split, the Commission has reworked its proposals in this part of Dorset so that the whole parish is included in a West Purbeck ward alongside other local parishes. The ward will also include both Bloxworth parish and Bere Regis as the Commission heard strong evidence about their shared community ties. The ward will be represented by two councillors. In the east of the new council area, local people and groups objected to the Commission’s draft proposal to divide the parish of Colehill between two wards. After listening to local views, the Commission’s final recommendations will ensure that the whole of Colehill is included in a Colehill & Wimborne Minster East ward. In Dorchester, the Commission received representations from local people to reduce the size of the multi-councillor wards it put forward as part of its draft recommendations for the town. After looking at local evidence and visiting the area, the Commission has decided to change its proposals in the west of Dorchester to create a Dorchester Poundbury ward which will elect one councillor. At the eastern edge of the authority, residents and organisations contacted the Commission during the consultation period to advise that its draft proposals did not reflect local ties as they divided the cohesive community of West Moors. In particular, the Commission’s proposal to include the northern part of West Moors parish in the Avon Heath & Moors Valley ward did not reflect the interests and identities of people and communities in this part of Dorset. In response, the Commission has changed it recommendations to create a West Moors & Three Legged Cross ward that keeps the parish wholly within a single ward. In the west of the county, the Commission has changed its proposals in the Bridport area as a result of local views expressed during the public consultation. As part of its draft proposals, the Commission had included the Walditch area in Chesil Bank ward. Strong local evidence concerning the clear links between Walditch and Bridport persuaded the Commission to change its proposed boundary so that the community will now be part of Bridport ward. In Weymouth, the Commission originally proposed a Preston & Radipole ward to the north of the town. Local people then argued that the two communities included in the ward shared little in the way of interests or identity. The Commission found the arguments persuasive and has amended its proposals to create a two-councillor Littlemoor & Preston ward alongside a two-councillor Radipole ward as a better reflection of community ties. Elsewhere in Dorset, the Commission has made minor amendments to the wards it originally proposed as well as changing the names of several wards after listening to local feedback. The changes, and the full recommendations, are available on the Commission’s website at www.lgbce.org.uk. The proposed new arrangements must now be implemented by Parliament. A draft Order – the legal document which brings into force the recommendations – will be laid in Parliament in the coming weeks. The draft Order provides for the electoral arrangements to come into force at the authority’s first elections in 2019. In May 2018, the government confirmed changes to local government in Dorset. The decision meant the creation of a new Dorset Council for the western part of the county. In July 2018, the Commission held a public consultation on its draft proposals for new ward boundaries and has taken into account all submissions made before finalising these recommendations. Full details of the Commission’s final recommendations (including maps) can be viewed at: https://consultation.lgbce.org.uk/node/13248.